Welcome to Captain Daniel J. Senesky as the new Commanding Officer of the Tulane NROTC Unit. He arrived at the beginning of the school year and has had a chance to enjoy the university and the city. Captain Senesky is a Surface Warfare Officer who hails from New Jersey. He graduated with a BA in Broadcasting from Pennsylvania State University and a MA in International Relations from Salve Regina University. 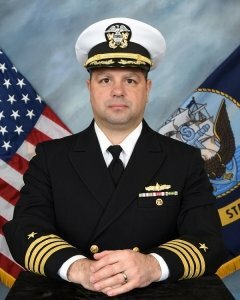 During his career, he has spent time aboard the USS Pyro, USS Carl Vinson, USS Fitzgerald, USS Higgins, and USS Gary running the gamut from Division Officer to CO. His shore time put him at OPNAV, CENTCOM, and most recently at the Joint Expeditionary Base Little Creek- Fort Story as Commanding Officer. Capt. Senesky has been lauded with awards and medals. This is Captain Senesky and his family’s first time in New Orleans and they are making it home by becoming part of the neighborhood and school communities. They had a blast at their first Mardi Gras. While the Midshipmen marched in the Pontchartrain parade, he enjoyed the parades from his vantage point along the crowded sidewalks. For more of Mardi Gras he said, “Wearing the Formal Dinner Dress uniform for the first time at Rex Ball was very cool. We had some family in town for Mardi Gras, so we ensured they sampled some king cake and spent some time on Bourbon Street, as well.” Trying the local cuisine and uniquely New Orleans experiences has been pleasure. He has tried several restaurants and specifically mentioned eating andouille sausage beignets. High on his list of future activities, especially after going to the Marine Corps Ball in the Superdome, is attending a Saints home game. We presume he will be cheering on the Black and Gold. The Alumni Association wishes you a great tour here at the Tulane University Naval ROTC.